Sarah Ann "Sally" (Dull) Saylor (1827- ? ) was born in October 1827 in Somerset County, PA, the daughter of George and Christina (Younkin) Dull. In 1848, when she was age 20 or 21, she was united in matrimony with 25-year-old Samuel Saylor (1823-1895), a resident of Milford Township, Somerset County. Their marriage lasted for almost 50 years. The couple initially resided near Benfords Store in Somerset, Somerset County, where Samuel plied his trade as a carpenter. He stayed with the carpentry work for 27 years. They were longtime members of the Methodist Church. The Saylors produced nine children, of whom six lived into adulthood -- Amanda Chappell, Mary "Anna" Saylor, Arimetta Saylor, Elizabeth Saylor, William W. Saylor, Charles Saylor, Albert Saylor and Marinda "Mabel" Saylor. After a dozen years of marriage, the couple in 1860 decided to seek better fortune in the midwest. They migrated to Iowa and settled in the emerging town of Waterloo, Black Hawk County. Census records for 1870 show the family remaining in Waterloo. Also making the move westward to Waterloo during that era were Sarah's brother John Dull (circa 1855) and brother Josiah Dull and his wife and family. John and his family remained in rural Waterloo for decades. The Josiah Dulls left Waterloo during the 1870s for a move to Geneseo, Cerro Gordo County, IA. In about 1871, the Saylors migrated to Jefferson, Bremer County, IA, where Samuel engaged in farming. The 1880 census shows them in Jefferson. In 1883, Samuel was profiled in the book History of Butler and Bremer Counties, Iowa (Springfield, IL: Union Publishing Company). 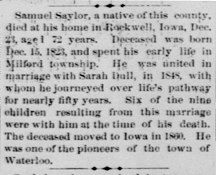 At the age of 72, on Dec. 23, 1895, Samuel passed away at home in the town of Rockwell, Cerro Gordo County, IA. An obituary in his old hometown newspaper, the Somerset Herald, noted that "Six of the nine children resulting from this marriage were with him at the time of his death." Sarah survived her husband by a number of years. The federal census enumeration of 1900 shows her living with her single daughters Amanda and Mabel in Rockwell. Her final story is not yet known. Daughter Amanda Cordo Saylor (1849-1915) was born on Oct. 22, 1848 in Milford Township, Somerset County, PA. She did not marry until middle age. At the age of 28 in 1880, she lived at home with her parents. After her father's death, she made her home with her widowed mother and in 1900 they were in Rockwell as shown by the census. On Nov. 26, 1908, when she was 56 years old, she was united in wedlock with Alfred Pierce Chappell (1853-1940), a Pennsylvania native and the son of Edward and Eliza (Pierce) Chappell. The nuptials were held in Rockwell. Alfred had been married twice before. The couple apparently relocated to Missouri and established a home in Sedalia, Pettis County at the corner of Fourth and Ohio Streets. Sadly, the marriage only lasted for seven years. Alfred lived for another 25 years after Amanda's passing and remained in Sedalia, marrying again to Annie (?). He died on Aug. 15, 1940 and rests for all time in Prairie Rose Cemetery in Corning, Adams County, IA. Daughter Mary A. Saylor (1852- ? ) was born in about 1852 in Somerset County, PA. Daughter Arimetta Saylor (1854- ? ) was born in about 1854 in Somerset County, PA. Daughter Elizabeth Saylor (1857- ? ) was born in about 1857 in Somerset County, PA. 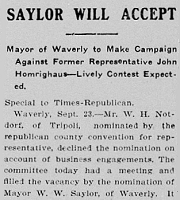 Son William W. Saylor (1859-1952) was born three days before Christmas 1859 in Somerset County, PA. The following year, as an infant, he migrated with his parents and siblings to Iowa, settling in the community of Waterloo. In 1880, when he was 21 years of age, he helped his father with farm labor in Jefferson, Bremer County, IA. On March 30, 1886, at the Free Methodist Episcopal Church in Waverly, Bremer County, the 27-year-old William married 22-year-old Kathryn "Kittie" Winner (1864-1946), daughter of Anson M. and Maranda (Campbell) Winner of Waverly, Bremer County. They produced three known children -- Merrill William Saylor, Lynn A. Saylor and an infant who died in 1898. Early in their marriage, the Saylors lived in Kimball, SD for two years but later returned to Waverly where they spent the rest of their lives. William was elected a state representative for the term 1904-1906 -- winning the election by about 50 votes -- and served on the town council of Waverly from 1894 to 1904, with a term as mayor (1903-1904). In a newspaper article about him accepting the nomination for representative, the influential role of the local German farming population was cited. William also was president of the Waverly Board of Education for many years. He made a living circa 1918 as a lumber salesman in Bremer County, and it was not unusual for him to deliver lumber filling three or more railcars to customers including county governments. Heartache shook the family when Katherine was killed instantly when she fell down a flight of stairs and broke her neck at the age of 82 on April 15, 1946. William survived her by six years. At the age of 93, he fell in his bedroom, fractured his hip and went into shock. He was rushed to Mercy Hospital in Waverly but nothing could be done. he died on Jan. 9, 1952. Burial was in Harlington Cemetery in Waverly. [Find-a-Grave] His is mentioned thrice in Joseph F. Grawe's 1914 book History of Bremer County, Iowa: A Record of Settlement, Vol. I. He and Kathryn also are named in the 1955 book by Alfred Decker Keator, Three Centuries of the Keator Family in America. Son Merrill William Saylor (1892-1942) was born on June 18, 1892 in Waverly. During World War I, he was a member of the 62nd Engineers Corps, Company B, holding the rank of corporal. He was mustered out of the army at Camp Dodge and returned home. He never married. At the age of 50, he suffered a heart attack at the home of his parents and died 12 days later on May 27, 1942. Burial was in Harlington Cemetery with a 21 gun salute at the graveside from members of the Waverly American Legion post. Son Lynn A. Saylor (1901- ? ) was born in about 1901. He resided in Elmhurst, IL in 1942. Son Charles R. Saylor (1865- ? ) was born in November 1865 in Waterloo, Black Hawk County, IA. At the age of 29, Charles married 21-year-old Myrtle "Myrtie" Gibson (1873- ? ) on April 4, 1894. She was the daughter of Civil War veteran Robert and Susan (McDowell) Gibson of Franklin County, IA. They were farmers and lived in Sugar Creek Township, Ceddo Gordo County. Their three known children were Florence M. Saylor, Seneca M. Saylor and Jean Saylor. Daughter Jean Saylor (1906- ? ) was born in about 1906 in Rockwell. On Sept. 11, 1924, when she was 18 years of age, Jean married Chris Weiss ( ? - ? ), a North Dakota native and the son of Adam and Barbara (Dubs) Weiss. The ceremony took place in Waterloo. Son Albert Saylor (1868- ? ) was born in about 1868 in Waterloo, Black Hawk County, IA. Daughter Marinda "Mabel" Saylor (1870- ? ) was born in May 1870 in Waterloo, Black Hawk County, IA. She may never have married. In 1900, census records show Mabel, Amanda and their widowed mother living under one roof in Rockwell, Cerro Gordo County, IA. Research for this page graciously shared by the late Donna (Younkin) Logan.